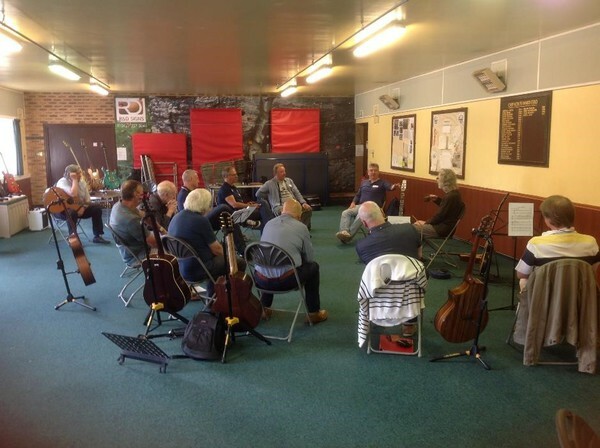 Yet another lovely SHARING DAY at my usual location, and what a lovely day it was with special guest Michael Gough setting guitars up for our guests and talking extensively about how he goes about building and setting up existing instruments. On the extreme left (above) is Michael Gough who did a wonderful job setting up folk’s guitars and chatting about his life as a guitar builder. I also borrowed one of his guitars to play THE DODO's DREAM. Me in full flight on THE DODO'S DREAM. Playing one of Mike's MG guitar. Also wonderful to have Paul Ward drop in to our sharing Day and share his memories of creating THE LAST OF ENGLAND. A huge THANKYOU to Cath and Geoff along with Malc and Karen for helping make tea and coffee. Graham and David sent these lovely emails below after the day. Here's to the next one, so watch this space. I wanted to say a big thank you for another wonderful day yesterday. It was a full, fun and inspiring day that has had me thinking about so many things since coming away. I could actually do with a sharing evening to share reflections on the day! There was a point in the late morning where I realised that this wasn't just about learning bits and pieces about playing guitar but an affirmation of how wonderful involvement in any music is and how life affirming it can be. Please give my thanks to Mike for his input which was excellent. 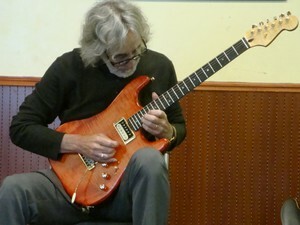 Interesting that with Mike and Bill we had two highly qualified and experienced computer experts who have both now realised that guitars are far more fun. Obviously moving away from the Dark side of the force is good for them! And please say a big thanks to Hilary and the folks who provided the tea, coffee and biccy's. They really helped make the day the success it was. But most of all thanks again to you for a tremendous day. Just a brief email to say how much I enjoyed taking part in the Sharing Day last Saturday. A truly inspirational experience ! To see you play the pieces close up was not only a privilege but also really helpful in interpreting the tab format of the music, particularly in some of the more intricate sections. Being a 'first timer' I have to admit being somewhat nervous of quite what to expect but the relaxed style of the whole day soon put me at ease. Overall I thought it was a great day, full of interest and I can't wait for the next one.